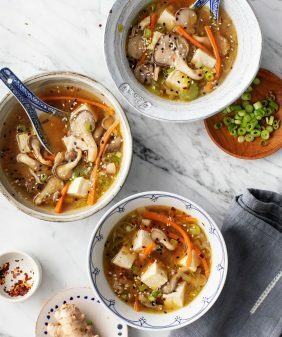 A simple dashi is the base of this warming, healing miso soup. 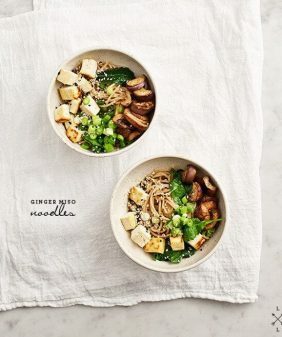 With lots of veggies, soba noodles & tofu, it's hearty enough to be a meal on its own. 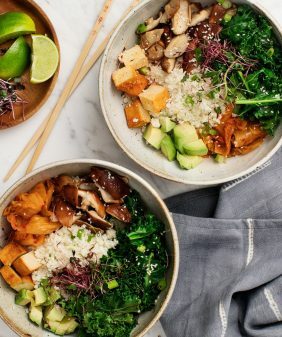 This soup is full of warming healing ingredients (shiitakes, ginger, miso, etc. )… and would be the perfect thing if you’re under the weather, figuratively or quite literally. If you need more soup recipe ideas, try this ginger miso soup, this many-veggie soup, or this vegan tomato soup! A simple homemade dashi is the base of this healing, warming miso soup. Tofu & soba noodles make it hearty enough for a full meal. Make the dashi: gently rinse the kombu piece. Place it in a medium pot with 4 cups water. Gently simmer for 10 minutes. Don’t let it boil, or the kombu flavor will turn bitter. Once the kombu piece is soft, remove it and bring the water to a boil for just a few minutes. Reduce heat again and add in ½ cup more water. In a small bowl, stir the miso paste together with some of the hot dashi water (until it’s not clumpy), then stir to incorporate it into the soup broth. 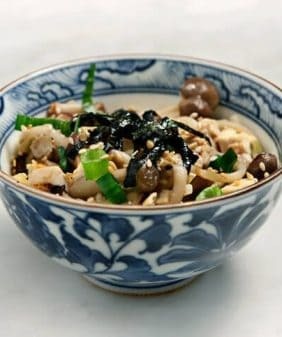 Add the ginger, scallions, and shiitakes, and gently simmer for about 10 minutes to cook the mushrooms (Note: If your soup is getting too thick add more water until it is a thinner consistency). In the last few minutes of cooking time, add the tofu and bok choy. Taste and adjust seasonings to your liking. Remove from heat once the bok choy is wilted but still has some bite. Add the cooked soba noodles. Top with shichimi and bonito flakes, (both optional), and serve with ponzu or extra soy sauce on the side. Note: some miso pastes can be saltier than others, start by adding less and add more to taste. If you over-salt, add more water. I used these Eden Soba noodles. I don't prefer the kind that's 100% buckwheat (it gets clumpy). If you're gluten-free, I recommend using King Soba's brown rice noodles Jovial's brown rice pasta or Tinkyada's brown rice noodles. Find kombu at Asian markets or high-end grocery stores. Or online here. Thanks for the inspiration! We are dead set in the middle of the storm here in Indiana and nothing is going to get me through this week more than a whole lot of warm soups, curries, and chilis (and maybe a few blankets / netflix). I’ve seen photos (my family lives up there), crazy weather – stay warm! It’s lumpy but if you mix it in a little bowl with warm water from the soup before incorporating, it dissolves better. Hope that helps! I neeeed this today! -10 and dropping, yikes! 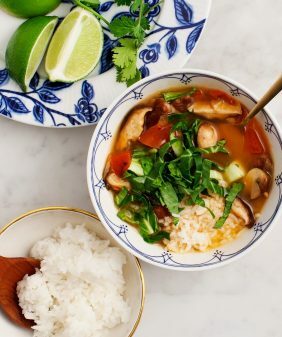 i dont know how people are doing in mid-west and east coast..its 14F in Dallas and I feel like I am freezing to death..this kind of recipe definitely soothes my soul and instantly warms me up. 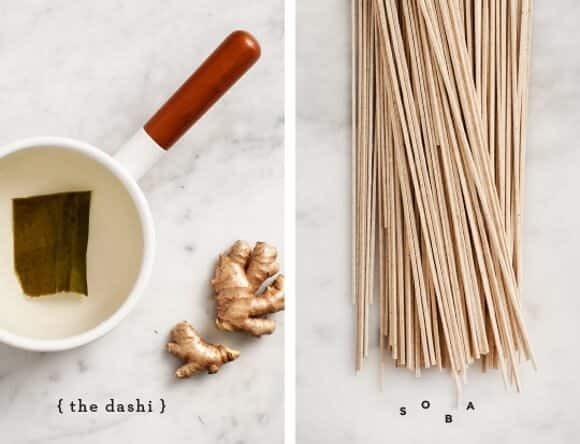 I have always wondered about dashi, thanks for that recipe. I know, it’s really not supposed to be this cold in Texas! oh also – this is not a super traditional dashi (I wanted to make it vegetarian) – normally bonito flakes go into the broth and get strained out. But nonetheless, the kombu really makes it – plus it’s healthy and easy to make. This soup looks dreamy! Yum! Thanks for your warm thoughts and warm soup! As a frozen Chicagoan, I truly appreciate it! 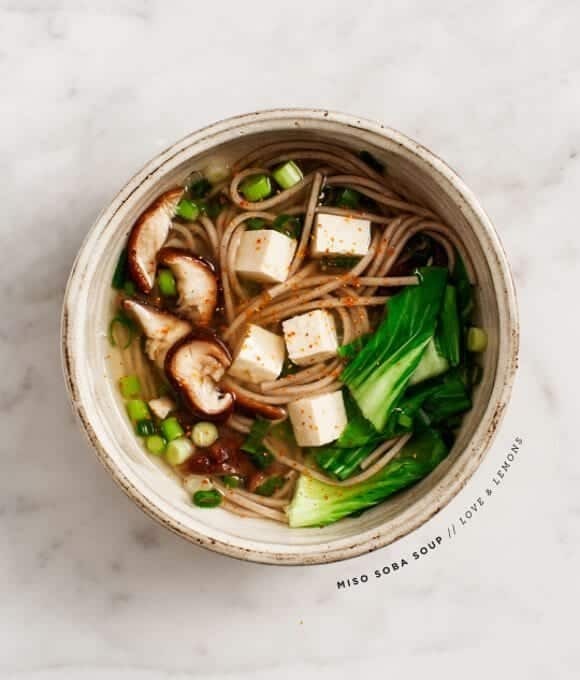 I keep looking at the soba noodles in my pantry and wondering why I don’t cook with them more often – this soup just makes me realise what I’m missing out on! What a lovely and warming soup to get through these dark and cold days. This looks so delicious and so warming. I’ve been fortunate not to experience record lows in California, but I still welcome a hot Asian soup. Oh does this soup look soul satisfying! Just glorious! Hi! The recipe looks great, as well as the pictures. I tried making it for my hubby who now has to eat fat free foods. However, ours turned out brown and not at all as pictured. It looked more like a brown, soupy pasta dish. I think we did everything according to the recipe, can’t figure out what we did wrong to fix it for next time. Our noodles where a little bit darker than yours, and we didn’t use the tofu. Do you have any idea what we could have done to make the soup turn out brown and not as pretty and clear as yours?? Hope you can help us out, cause I really want to try and make it again. Thanks for posting the recipe! Hi! do you have recommendation for a certain kind of soba noodles? I just made this and my noodles got super gloppy and overcooked. But I loved the taste, so I’d like to try again. thanks! oh no! I usually buy the Eden brand, I got a brand the other day called King Soba that I also really liked. They’re not 100% buckwheat, I use the kind that has some semolina mixed in (which aren’t gluten free). If they became overcooked I would add them closer to the end – so that the soup is finished right as the noodles are done. Cool, thanks! Love your site – I had your healthy stuffed sweet potatoes for lunch! Delicious! I used spinach instead of bok choy and it turned out amazing. 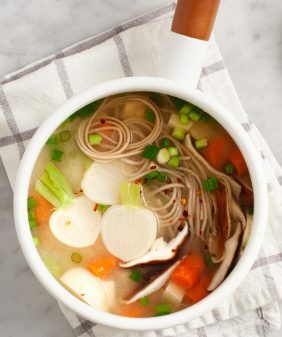 This is one of my favorite homemade miso soups! Thanks so much for sharing. so glad you liked it! !